So. Late the other night, replete with good food and good conversation, I drove home from my book club meeting. My headlights piercing the darkness, I watched for black ice created by snow blowing across the open fields, and listened to a wonderful interview with Canadian singer-songwriter Rufus Wainwright on CBC radio. 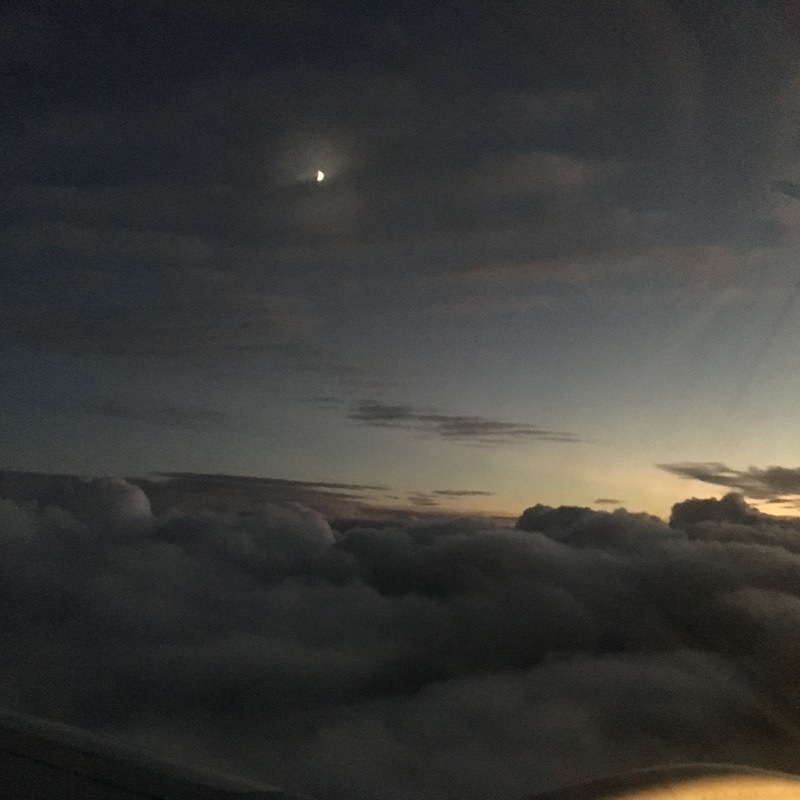 Moon over Ottawa as seen from our plane as we arrived home from Rome in October. At my book club meeting, we’d sipped white wine, eaten take-out Chinese food, and enjoyed a fulsome and satisfying discussion of the book Forgiveness by Mark Sakamoto. Forgiveness: A Gift from My Grandparents is a memoir/biography written about Sakamoto’s grandparents: Ralph McLean, who left Canada’s Magdalen Islands to fight in World War II, was captured in Hong Kong, and spent five years in a Japanese POW camp; and Mitsue Sakamoto from Vancouver, whose family lost their business, and their home, and, like so many Japanese-Canadians, were sent to internment camps for the duration of the war. Eventually the children of Ralph and Mituse meet and marry, and give birth to the author. Reviewers talk of the book’s ability to capture a difficult time in Canada’s history, one that somewhat belies the myth of our modern, perfectly multicultural society. 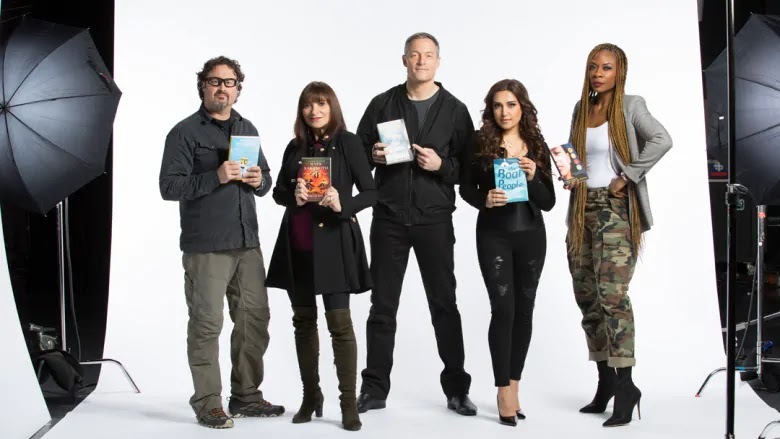 Canada Reads 2018, the five “defenders” holding the book each will defend. Forgiveness was the “Canada Reads” winner for 2018. My friends and I all loved the idea of the book, and the story. We’d been convinced to read it partly due to the impassioned defense of the book by fashion-journalist Jeanne Becker. Becker, the child of Holocaust survivors, made a convincing plea on “Canada Reads” that this book about surviving trauma, and moving on, is one all Canadians should read. So we did. But we didn’t universally love the book. I had trouble finishing it. I really wanted to love it, but I didn’t. 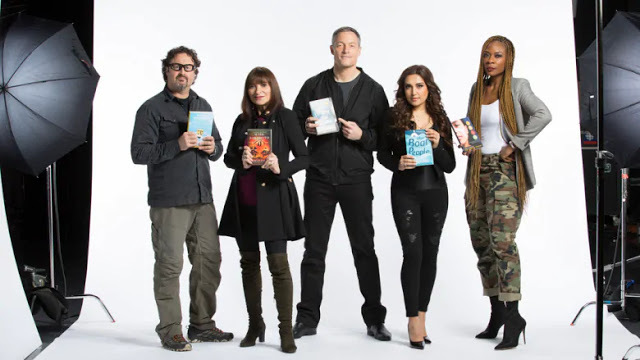 What I do love, however, is the whole concept of “Canada Reads,” a kind of literary “Survivor” run by CBC, in which readers from all walks of life (journalists, singers, actors, comedians, scientists) defend a book, and each day of a four day event they vote one book off the show. I listen to it avidly on the radio each year. Last year, I sat in the car sipping my latte, and listening to Jeanne Becker’s defense of the book Forgiveness, waiting for the final vote, and in the process making myself late for my appointment with a designer about our house renos. I should say that the designer was not entirely sanguine about my tardiness despite the very good reason for it. But back to Friday night. As I said, after our meeting, I drove home listening to CBC radio, to a re-airing of an episode of one of my favourite shows,”Q”, a music and culture program, whose executive producer is, coincidentally, the son of a good friend. Ha. Wheels within wheels, eh? The host was speaking with Canadian singer-songwriter Rufus Wainwright about his career, and, in particular, about the opera Hadrian which he composed, and which is being staged this fall in Toronto. I love Rufus Wainwright. In my opinion, he’s a Canadian icon, even if he is a bit young for such an appellation. And he’s the son of another Canadian icon, Kate McGarrigle, of the folk singing duo Kate and Anna McGarrigle. Here’s Wainwright singing at Sting’s 60th birthday concert in 2011. Gad. I love his voice. I’ve spent way too much time as I’ve been writing this post buried in YouTube videos, and clips of interviews; I even watched some of Wainwright’s new opera Hadrian. Such a sad story, and one that I knew nothing about. Then I came upon the video below. It’s Rufus Wainwright singing that iconic Leonard Cohen song Hallelujah with 1500 members of a group called Choir!Choir!Choir! in the old Hearne generating station as part of Toronto’s 2016 Luminato Festival. Choir!Choir!Choir!, the brainchild of Daveed Goldman and Nobu Adilman, is an open choral group; anyone can attend and is free to join in. Isn’t that cool? You can read what they’re all about here. Ah, that was awesome, wasn’t it? But instead I want to leave you with this short and somewhat shaky video that I filmed on our first day in Rome in October. Hubby and I were thrilled to find a little bit of Leonard Cohen, and a little bit of Canada, on a sunny day in Rome. So, yeah, driving home last Friday from my book club was kind of magical. Listening to Wainwright singing in the darkness of my car, I felt grateful for good friends, for books and music, for Canadian authors and singers and songwriters, and for the CBC which brings us so many wonderful moments. I think we should all be grateful for the CBC, grateful that we have such an entity as public radio. And… I may be biased… but I think we all need a little more Canada in our lives. P.S. Apologies to Heather Reisman for (kind of) stealing her line. Public radio is a great joy. Our BBC, despite its faults, is one of our best achievements and it fills my days. I am all in favour of gratitude and also of Rufus Wainwright and his haunting voice. But I'm not sure about the literature of my own country at present. Perhaps I need to go and stand in front of some shelves today and take a look. Our literature reflects our culture so could be a little perplexing. It's a foggy day here and I feel rather the same way. That's because I woke up to the BBC. There have been times over the years that I've listened to something on CBC and been astounded that such thing as public radio still exists in our crazy, superficial world. It's rather perfect to be listening to public radio on a foggy day, I'd say. I do enjoy the CBC. The Canadian stories, learning more of our history and so much more. I loved listening to the Vinyl Cafe and Rewind. How nice to see a bit of home being in Rome. Hallelujah always brings a tear to my eye as it’s so beautiful. I used to love Vinyl Cafe too. I'd always listen as I was settling down with my tea and my marking on Sundays. We even listened to CBC in Italy because I have the ap on my i-pad. A voice on the radio that i couldn’t get out of my head. An interview on NPR — Rufus Wainwright. I was bewitched by his talent. I have every recording, video, and article. My son took me to a concert in Austin, Texas where I met Rufus and chatted with him—He likes old ladies. I went to a concert in Los Angeles featuring Rufus and his mother, and another in New York. I’m a groupie in my 70s. That must have been wonderful to see Rufus Wainwright in concert and even meet him. He's been touring since he was very young with his mother and aunt and sister. He said on the show I listened to the other night that composing and working on the production of his opera is wonderful, partly because he is home and not touring. It must be a hard grind after many years. I loved your video. Congrats. So much fun to do that on a cruise! I kept wondering if I could see you in the video. Thank you, thank you, thank you for introducing me to Rufus Wainright's wonderful voice. (I know. I live under a rock. One a fair way south of Canada.) Will now go follow Deborah's lead. You didn't waste your time seeking out those video's. I thoroughly enjoyed them. Ah.. you're very welcome. He's amazing, I think. I love public tv as well. We hardly watch anything else. Your book club meeting sounds great, we have tea, coffee and biscuits! Occasionally we have wine though. I love Rufus Wainwright. I just love his voice. He "warbles" just like his mum and his aunt. I loved the McGarrigle Sisters too. I have roots that run over the border into Canada, and so some of my favorite relatives live in your great land!